mRNA chains contain NTPs instead of dNTPs. Now, TTP is very (very) rarely found in cells. So, RNA Polymerase can look for 2'-OH in nucleotide for adding base (pay attention that RNA polymerase is not known to have proofreading mechanisms, but there is growing evidence that RNA polymerase can correct a faulty base pair matching, see Thomas et al). RNA polymerases are known to be able to distinguish between NTPs and dNTPs (Svetlov et al), although the precise mechanisms in multi-subunit RNA polymerase remain elusive. Yet, this property certainly plays a role (refer to EDIT 1 for details about this). Just for information, we know the flip side i.e. how DNA polymerases prevent dUTP from adding in DNA chains, because dUTP is much more common than TTP. Simply saying, they don't. Mutations can (and do) occur, leading to faulty addition of dUTP in DNA. But, this is where repair machinery helps. Cells contain an enzyme, uracil DNA glycosylase, which replaces uracil by thumine in DNA (Longo et al). So, until we find the exact mechanism for RNA polymerase, you can assume that it uses much similar mechanism for proofreading (along with the first one of course). Pay attention at the Tyr639 and His784 (sugar discriminators), this is how the RNA polymerase distinguishes NTP from dNTP. It has also been shown that removing Tyr639 will convert the RNA polymerase to DNA polymerase(! ), though removing His784 would just decrease its activity, suggesting its role to be minor w.r.t. Tyr639. For more information, have a look at this page from Brooklyn college website. The sugar discriminators of RNA polymerase (describe above) do not allow dNTPs to add to the growing chain. Thus dNTPs cannot act as substrates for RNA synthesis. The enzyme for synthesis of thymine (dTTP) is thymidylate synthase, which requires dUMP as substrate. Thus, it is not possible to create rTTP instead of dTTP. Conversion of uracil to thymine requires energy, meaning uracil is energetically less expensive than thymine. This also directly explains (partly) why mRNA doesn't incorporate thymine into the chain. As is visible, 2' -OH is an important part for RNA degradation. Thus, it wouldn't be possible to degrade mRNA in this way if it contained dNTPs. Matthew J Thomas, Angelina A Platas, Diane K Hawley, Transcriptional Fidelity and Proofreading by RNA Polymerase II, Cell, Volume 93, Issue 4, 15 May 1998, Pages 627-637, ISSN 0092-8674, http://dx.doi.org/10.1016/S0092-8674(00)81191-5. Mary C. Longo, Mark S. Berninger, James L. Hartley, Use of uracil DNA glycosylase to control carry-over contamination in polymerase chain reactions, Gene, Volume 93, Issue 1, 1 September 1990, Pages 125-128, ISSN 0378-1119, http://dx.doi.org/10.1016/0378-1119(90)90145-H.
Roberts, Gordon C. K. et al. 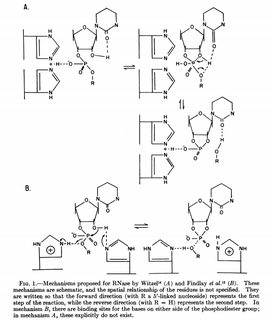 “THE MECHANISM OF ACTION OF RIBONUCLEASE.” Proceedings of the National Academy of Sciences of the United States of America 62.4 (1969): 1151–1158. Thymine is not incorporated into mRNA because the precursors of RNA synthesis are ribonucleoside triphosphates (not the free bases) and there is no pathway for the synthesis ribothymidine triphosphate (rTTP) in cells — only for the synthesis of deoxthymidine triphosphate (dTTP). I suspect that this rather naïve question arises from the misconception, common among those exposed only to brief popular accounts of the topic, that free bases are the precursors of nucleic acids. In fact it is the nucleoside triphosphates, that are the precursors, and the key difference between RNA and DNA is between the sugars ribose and 2-dexoyribose. It is obvious that RNA polymerases are specific for ribonucleoside triphosphates, otherwise deoxyribose would be found in RNA. Rider: Why is there dTTP but not rTTP? Although not strictly part of the answer, I think that it may provide a perspective on the topic to explain why there is no rTTP in cells, even though there is dTTP. This is because of the way dTTP is synthesized — not the trendiest of topics — but one involving enzymes that are so crucial to DNA synthesis that certain large DNA viruses encode their own copies. * The diagrams below are my own. A more extensive account can be found in Chapter 25 of Berg et al. online — Nucleotide Biosynthesis. *These are the herpes viruses. Although not found in every case, the following enzymes occur in various herpes virus genomes: ribonucleotide reductase, thymidylate synthase, dUTPase, dihydrofolate reductase and thymidine kinase. Not the answer you're looking for? Browse other questions tagged biochemistry cell-biology dna rna transcription or ask your own question.